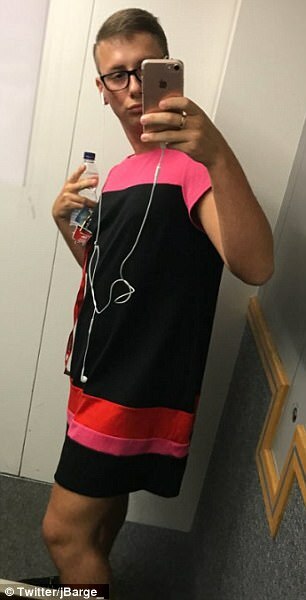 ❝ A defiant call centre worker who was sent home for wearing shorts to the office in this week’s heatwave came back wearing a bright pink dress as a ‘protest’ against the dress code. Joey Barge, 20, from Buckinghamshire, turned up in a pair of smart blue shorts on but bosses deemed them inappropriate despite the sweltering heat. ❝ But rather than changing into a stuffy suit, the call centre worker decided to don a bright pink dress as a ‘protest’ against the rules. Predicting that he’d be sent home again, Joey posted a chic selfie to Twitter, racking up dozens of likes and retweets.